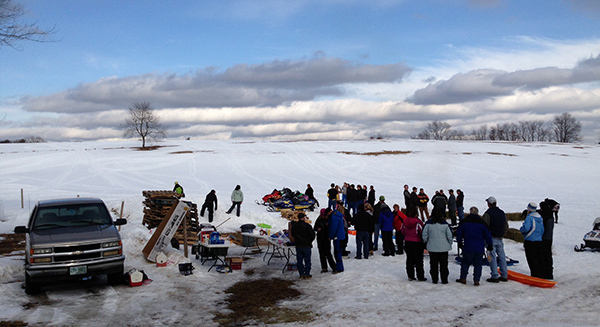 Come join the Suncook Valley Sno Riders snowmobile club at Elm Terrace Farm on Dowboro Rd in Pittsfield (near #580 Dowboro Rd in the field near the road, on the Epsom town line) for the annual sledding party/bonfire! Ride your snowmobile or trailer your snowmobiles to the event. There will be hot dogs, hamburgers and hot chocolate. The snowmobile trail that takes you to the farm is off of the Catamount trail headed towards Epsom. On the Catamount trail cross over the road when you get to Hill Rd after Charlie Watson's fields. Bring your own sleds, the club will buy the hot dogs and burgers! Elm Terrace Farm provides the bonfire!